In the spring of 2016, a dedication ceremony was held for the Theodore Roosevelt Visitor Center a few miles south of Onward, Mississippi. The location is right on the side of Highway 61 and very close to Smede’s Plantation, where in 1902, President Theodore Roosevelt disembarked from an Illinois Central train at a cotton loading ramp to begin what has been called the most important hunt on American soil. We all know the story of how the President of the United States had been promised the first bear on a hunt that had been set up by Stuyvesant Fish, president of the Illinois Central Railroad, and native Mississippians John Parker, E.C. Mangrum, Huger Foote and Senator Leroy Percy. 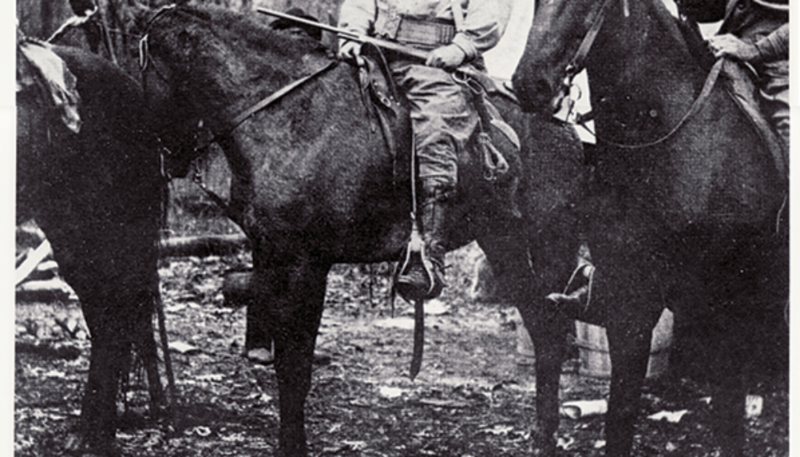 Upon Percy’s request, the Metcalfe brothers, Clive and Harley, enlisted their trusted friend, ex-slave and Confederate Cavalryman Holt Collier to lead the hunt. Collier, and his pack of bear hounds, was renowned throughout the South as being among the best there was. King Cotton had caused the deforestation of a good bit of the Mississippi Delta by the turn of the century and about the only remaining bear habitat was in the South Delta, through which the Big and Little Sunflower Rivers, Steele Bayou and Deer Creek flowed. It was a deep, primeval and untouched wilderness, choked with dense forests of virgin hardwood timber and laced with almost impenetrable canebrakes, the favorite lair of the Louisiana Black Bear. It was into this morass that the small hunting party rode on horseback to a primitive camp that Holt and his fellow guides had hacked into the bank of the Little Sunflower River. 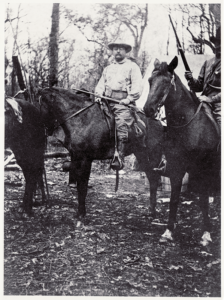 The President did not get a bear and refused to shoot a tethered 300-pound bear that Holt Collier had run right by the very log where Roosevelt had been given explicit instructions to stay. Because of a decision to return to camp for a bite to eat, the President missed his chance, and in an ensuing fight with the bear hounds, once the bear bayed, Collier ran into the melee and clubbing his rifle, hit the bear at the base of his skull, stunning the bear and allowing the bruin to be lassoed and tied to a tree. A cartoon in the Washington Post by Clifford Berryman entitled “Drawing the Line in Mississippi” led to the creation of the world-famous children’s toy, the Teddy Bear. Simon Roosevelt, great grandson of President Theodore Roosevelt, had spoken at the dedication ceremony remarking on the significance of the 1902 bear hunt and importance of the reforestation efforts through U.S. Government conservation programs of mass amounts of bottomland acreage. As a sitting board member of the Boone and Crockett Club, a premier conservation and record-keeping organization founded by his great grandfather, Simon knows firsthand the importance of habitat restoration and the role it plays in the resurgence of the Louisiana Black Bear into its natural environment. Thousands of acres have been put back into trees along riverine corridors connecting vast areas of state and federal wildlife preserves thus creating travel lanes and denning places for the recovery of a viable bear population through natural replacement and growth. Through these efforts, the bears are coming back and growing in healthy numbers in certain areas of the Delta. Location efforts through tagging and radio transmitter programs have allowed state and federal game officials to track movement and population increases throughout a vast area of our state. The bears are back and growing in healthy numbers! As I visited with Simon and others, including Holt Collier’s great niece, Anne Marie Parker, it dawned on me that I knew personally many of the direct descendants of the original hunting party that was on the 1902 hunt. I began to envision a reunion of that group and what an important event that would be in the annals of hunting history to have an opportunity to gather together descendants of the participants of what has been called the most important hunt ever to be held on American soil. 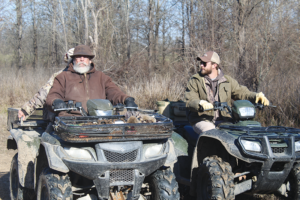 Due east, and not many miles from the original hunt along the Little Sunflower River, is my friend Howard Brent’s 4,500-acre hunting preserve. Panther Tract is a model of conservation efforts in habitat restoration with a beautiful lodge that can accommodate comfortably many guests. Nestled along the northern boundary of the huge Panther Swamp Wildlife Preserve and Delta National Forest and bounded by the Yazoo and Sunflower Rivers and Wolfe Lake, this pristine area is a wildlife mecca, including the evasive and habitat destroying feral hog. Why not host a hog hunt on horseback and have as many of the descendants as possible attend and participate? Once I mentioned this to Howard Brent, the charge was on and plans began to fall into place. We were going to have a black bear/wild hog hunt re-enactment. We decided to have the hunt in February, prime time for wild hog hunting and during the time that bears were hunted in olden days. Guest lists were compiled and hog hunter emeritus Rod Stegall was contacted to lead the hunt with his pack of mixed breed hog dogs. Fellow horsemen and horsewomen were contacted, and before long, the die had been cast and the re-enactment was set. A twinge of excitement was in the air as we all realized we were going to be involved in history in the making. The hunt was on. Like the 1902 bear hunt when secrecy and privacy was evermore prevalent at the request of President Roosevelt, guest lists had to be kept to a guarded minimum. Minor Buchanan, author of Holt Collier: His Life, His Roosevelt Hunts, and the Origin of the Teddy Bear agreed to come and give a talk on the original 1902 hunt. Author James McCafferty, who had just written The Bear Hunter: The Life and Times of Robert Eager Bobo in the Canebrakes of the Old South would be in attendance. Direct descendants of the original hunting party included Billy Percy, Simon Roosevelt, Huger Foote, Harley Metcalfe and ??? Parker, Holt Collier’s grandniece. Ardent sportsman Governor Phil Bryant accepted an invitation and came to hunt. A campsite had been set next to the woods with huge logs to sit on hauled in and set around a large fire pit dug in the ground. Efforts were made to depict and recreate the original campsite with a large canvas guide tent erected very similar to the one President Roosevelt slept in over a hundred years before. Suitable bedding was supplied with a large buffalo rug placed over the top for warmth. Simon Roosevelt looked forward to spending the night on the ground within twenty miles of where his great grandfather had once slept. Early on the morning of the hunt, and after a wonderful evening at the Panther Tract lodge the night before, complete with a sumptuous feast and much frivolity and conversation around the roaring fire, not to mention the guitar picking and singing that always goes along with an evening at Panther Tract, the day broke cold and crisp with excitement in the air. Buckets of hot coffee were consumed as horses and hunters and hog dogs, yapping and squealing with excitement, arrived and began getting tacked and geared up. Saddles were cinched tight on prancing horses; Kevlar vests and electronic tracking collars were fitted on the hog dogs, and four wheelers and Polaris Rangers were gassed and revved up in anticipation of a glorious day afield. A hog hunt in the wilds of the Mississippi Delta is not a picnic nor is it like an English attired fox hunt, scampering over hill and dale. Wild hogs are very dangerous animals that can turn and hurt you or your horse without a moment’s notice. Once bayed, a wild hog will fight with utter abandon, ripping and tearing anything within his reach with razor sharp tusks that can grow to four inches in length. A cornered hog is not a happy camper, and it is a true test of skill to take one with a knife, which is the best way to dispatch a hog in the thickets of the swamplands of the Delta. 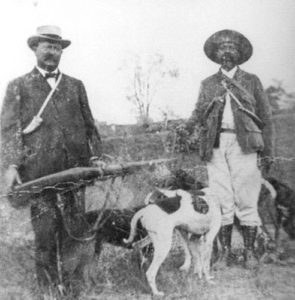 The hunters, those few that would stay close to the dogs and follow them into the thickest part of the swamp, included Simon Roosevelt and Governor Bryant. Soon the dogs struck a trail, and the hunt was on. 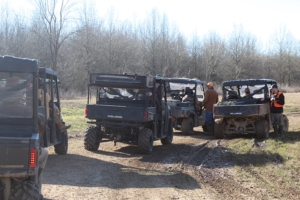 I had instructed the rest of the followers on horses and all-terrain vehicles to stay behind a bit and on the roads that crisscrossed the hunting preserve in order not to get in the way of the dogs or the progress of the hunt. What a glorious day it was with good hunting, good camaraderie and good times had by all. Hogs were taken, and no dogs were hurt. During lunch, back at the lodge, talks were given around another roaring fire, depicting the original hunt and the importance of the people involved in that occasion that happened over a hundred years prior. History was made again in the south Delta. We were all proud to be a part of it.